Many auto accidents occur because drivers are focusing on something other than driving. Distracted driving was a major factor in 3,157 crashes and 3,450 fatalities that occurred in 2016, according to the Insurance Information Institute. Visual Distractions. These are tasks that require drivers to take their eyes off the road. For example, a driver looks at his smartphone to check his location on a navigation app. Manual Distractions. These tasks cause a driver to remove one or both hands from the steering wheel. For instance, a driver removes her right hand from the steering wheel to grasp the coffee mug sitting in the cup holder beside her. Cognitive Distractions. These are mental distractions that divert a person's attention from driving. For example, a worker driving to a client meeting is thinking about her sales presentation rather than the traffic in front of her. Vehicle operators often engage in secondary activities while driving. Some examples are listed below. Because these activities draw the driver's attention away from driving, they increase the chance that the driver will cause an auto accident. A driver may be affected by multiple distractions. In the following example, the driver is distracted by a combination of visual, manual, and cognitive tasks. Nick is a technician for Nifty Nerds, a computer services company. He is driving to a client's office in a company-owned truck and is fuming over a recent argument with his boss. The client phoned yesterday and complained that software Nick installed last week isn't working properly. Nick's boss began yelling at him the moment Nick arrived at work. He demanded that Nick resolve the client's software issue immediately. With his coffee mug in one hand, Nick maneuvers the truck through heavy traffic. He is approaching an intersection but can't remember which way he needs to turn. He glances at the truck's GPS monitor for guidance but gets distracted by his ringing cellphone. His boss is probably calling to yell at him again. Swearing loudly, Nick slams his mug in the cup holder and reaches across the passenger seat for his phone. Suddenly he hears tires squealing and then a loud crash as he rear-ends the vehicle in front of him. Fortunately, no one is injured. Nick is surprised when the police report cites his distracted driving as the cause of the crash. 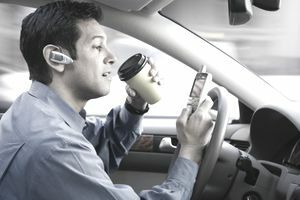 The survey showed that 2.9% of drivers were holding a cellphone to their ear, .4% were using a visible headset, and 2% were visibly manipulating a handheld device. An estimated 5.3% of drivers were using a phone (handheld or hands-free). Many drivers use cell phones while driving even though they are aware of the dangers. Texting is particularly dangerous because it constitutes a three-level distraction (visual, manual and cognitive). Most states have enacted laws that prohibit texting while driving. Still, many drivers continue this practice, particularly teenagers. In 2015, the CDC surveyed high school students aged 14 and over about texting and driving. Of the 101,397 students surveyed, 38% said they had texted while driving at least once during the previous 30 days. A number of states prohibit the use of hand-held phones while driving. But are hands-free devices really safer than the hand-held variety? The answer may be no, according to the NHTSA. Whether hand-held or hands-free, cell phones are distracting. They can prevent a driver from reacting quickly enough to avoid an accident. Employers can be held vicariously liable for injuries to third parties caused by auto accidents triggered by distracted employees. If your employees must drive company autos to perform their job duties, you and your workers should be insured for auto liability under a business auto policy. If your workers drive their personal vehicles on behalf of your business, your policy should include non-owned auto liability coverage. The latter protects your firm against claims arising out of accidents involving vehicles you don't own. Non-owned auto liability coverage does not cover claims filed against your employees. Such claims can be insured via an endorsement called Employees as Insureds. As an employer, you are obligated to safeguard your employees from injuries they might sustain on the job. You can help protect them against auto accidents by developing a written policy on the use of cell phones while driving. The safest approach is to prohibit employees from using cell phones when they drive. For assistance drafting a cell phone policy, contact your auto insurer. You can also get help from certain government agencies. For instance, the Texas Division of Workers Compensation offers a workplace program on driving and using cell phones. Once you have put your cell phone policy into practice, you will need to enforce it. You can use insurance technology (such as telematics) to monitor employees' use of cell phones while driving. An alternative is an app that shuts off cell phones when vehicles are in motion. Is Your Business Liable for Accidents Caused by a Car Thief?